The talk (invited by philosophy students) was given in the philosophy department of the University of Zurich on Monday 11th March 2019. Details provided here were provisional and illustrative because I expected the presentation to be highly interactive, with topics selected in response to the audience, and partly because I offered an unfamiliar combination of topics, linking philosophy, biology (especially evolution), mathematics, AI/robotics, linguistics, psychology, neuroscience and physics/chemistry. Links are provided below for following up the main themes. How can a physical universe produce mathematical minds? And why are they so hard to replicate in current AI systems? This is a progress report on a long-term project. Most theories of learning assume there's a fixed type of world to be understood by learners, whereas biological evolution, in collaboration with its products, is metaphysically creative, constantly extending the diversity and complexity of the world to be understood, using ever expanding forms of compositionality, requiring increasingly complex mathematical mechanisms in understanders. (Its powers and achievements exceed all other known examples of creativity, including the forms of "transformational creativity" in humans discussed by Margaret Boden.) Extending the types of learners adds to the mathematical and causal complexity of what needs to be understood, especially in recently evolved learners trying to understand themselves. Human mathematical competences are not yet understood well enough, to be modelled or replicated (despite fashionable claims), though Immanuel Kant identified some key aspects of the task in 1781, summarised in . It is not widely appreciated that as evolution produces increasingly complex organisms, with increasingly complex behaviours, it uses increasingly sophisticated mathematical discoveries. There are infinitely many different mathematical structures of different kinds, including: Boolean logic, the natural numbers (0, 1, 2, 3, 4, ....), the positive ratios (1/2, 1/3, 2/3, 1/4, ....), groups and other algebraic structures, Euclidean geometry, the topological (non-metrical) subset of Euclidean geometry, negative feedback and other information-based control structures, the probability space for "throws" of N perfectly balanced six sided dice, and Turing's "universal" computing machines. These structures are abstract structured types, that exist whether or not physical instances of those types exist, and whether or not any thinkers notice or make use of their existence. Among the mathematical structures/types "discovered" and used by biological evolution are designs for increasingly complex organisms, for types of mechanism used by such organism, and types of information used for control, e.g. control of reproduction, control of growth, control of temperature, control of chemical balances, and, more obviously, control of motivation, perception, learning, communication, and many more. E.g. use of negative-feedback control loops to keep systems within safe parts of their state-space, or to move them toward desirable states or away from undesirable states, is commonplace in organisms, though human engineers (e.g. James Watt, who invented the Watt centrifugal speed governor for steam engines) did not discover and use such control structures until millions of years after they began to be used by evolution and its products. This points to the deep connection between mathematical cognition and causal cognition. If humans had to learn languages, instead of being able to create them (cooperatively), then the thousands of known human languages could not have existed, because there were originally no language users to learn from, at least not on this planet. A key feature is that the specific powers produced during development are not all specified in the genome: some of them, e.g. later acquisition of skills and knowledge, are absorbed from aspects of the environment influenced by ancestors, e.g. results of prior stages of cultural evolution, or changes in other species, as illustrated by evolved symbiosis. E.g. in 2019, development in many young children is strongly influenced by computer based products of older generations who did not have access to those products when they were children. Some of the more recently evolved parts of the human genome, whose expression occurs relatively late during development, produce enormously varied adult competences, including inventive powers that cannot result simply from a uniform learning mechanism presented with examples of invention. 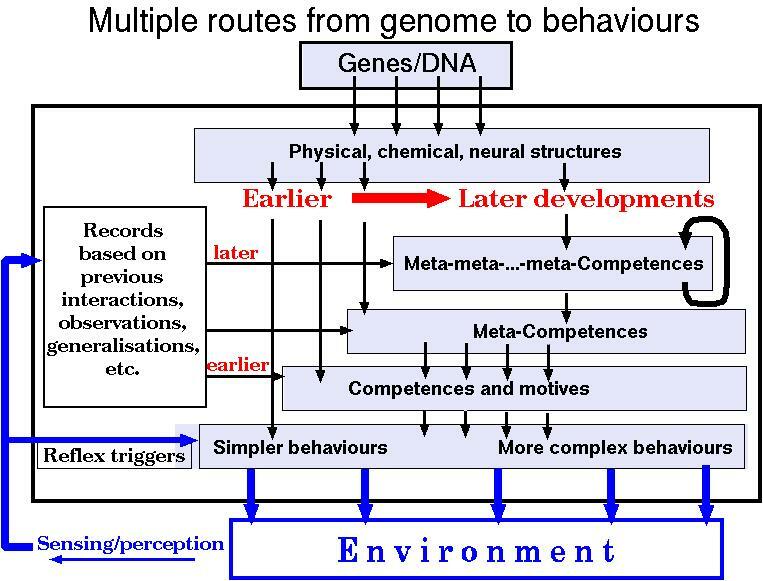 We can think of competences produced by later stages of gene expression as being parametrised: information in the relevant genes has gaps for parameters that are extracted from relevant subsets of the records derived from the environment during earlier gene expression (box on left). Since those records can be very different in different cultures, the genes expressed late may have very different effects in individuals born with identical genomes developing in different environments. Language development is an obvious example, but there are many more. Moreover, these processes can constantly modify the environment in which individuals develop, so the same genome can produce enormously varied late developing products. This is evident in the history of mathematics, science, art, literature, engineering, architecture, etc. (I believe these ideas are related to but different from Annette Karmiloff-Smith's ideas about "representational redescription" in her book Beyond Modularity (1992). All that diversity can therefore be attributed, at base, to the creativity of biological evolution, including both its ability to produce meta-configured genomes and its ability to produce constantly changing external products of roughly the same genomes. Despite impressive recent results, nothing in current AI matches or explains the evolved types of spatial intelligence found in squirrels, weaver birds, elephants, human toddlers and ancient mathematicians, e.g. Archimedes, Euclid, Zeno, and others. (That's why I'll refuse to use a self-drive car in cluttered busy urban environments.) Current psychology and neuroscience also lack the required explanatory power. Partly inspired by Immanuel Kant and Alan Turing I'll outline a research programme, the Meta-Morphogenesis project, aiming to fill deep gaps in our scientific and philosophical theories, including perhaps chemistry-based extensions to Turing-computability, which Turing himself implied might be needed in his PhD Thesis. using ideas developed in collaboration with Jackie Chappell. Compare uses of spatial intelligence in our ancestors to make deep mathematical discoveries (e.g. in geometry and topology) and recent advances in theoretical physics that those ancient thinkers could not have produced. the Birmingham FraMEPhys project, @FraMEPhys.